Nope, that P&P does not stand for Pick & Pay (it actually stands for Peach & Pomegranate)… I personally love slushies, something about sucking the juice out of the ice and then biting down on the dry ice (it’s like a snow party in my mouth) makes me happy. This is my first slushie recipe, and incidentally the first time I used my Zoku Slushie & Shake Maker too! The slushie maker is so easy to use, it definitely doesn’t require any brain power whatsoever. As long as you can read the instructions in the box, you’ll be fine. 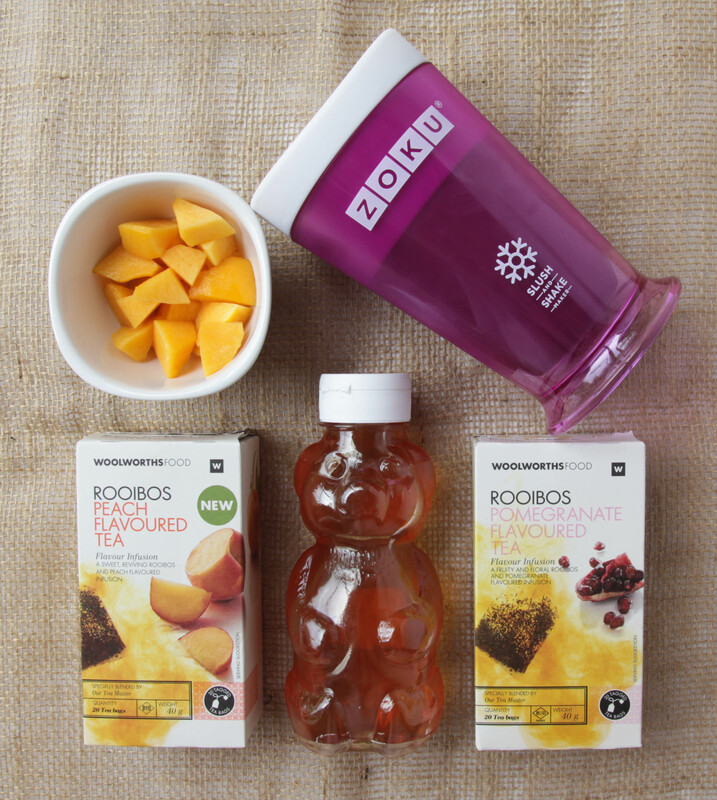 You can purchase the Zoku Slushie & Shake Maker online at Yuppiechef here – it retails for R 250,00 (maybe add it to your Christmas wish list if you are into slushies). I have seen other slushie makers around (I think from Verimark) but I can’t comment on how well those ones work. All you have to do to get the ball rolling is freeze the inner part of the slushie maker for about 6 hours (I froze mine overnight and I’ve decided to just keep it in the freezer from now on so that it’s always ready for a slushie). When you’re ready to make your slushie, pop the inner part back into the outer plastic container & then you can pour in fruit juices, sweetened coffees, fizzy drinks, energy drinks (basically anything, as long as it’s cold). Let it stand for about 2 minutes and then scrape the sides of the Slushie Maker with the special spoon that is provided. Let it sit for another 2 minutes and scrape again. Continue this process until the liquid has been slushified (that’s a word, right?). The whole process took about 10 minutes for my slushie. But don’t worry, you’re NOT scraping the sides for 10 minutes straight – it takes about 10 seconds per every 2 minutes to scrape. You can then add any cold / frozen fruit pieces to the slushie – yum! For today’s recipe, I wanted to try an iced tea slushie. I always make my own iced teas at home because I can control what goes into it – the same with my smoothies (except for a Kauai smoothie, love them!). I like using a mixture of normal Rooibos tea bags and then flavoured tea bags too. I prepped the iced tea last night because I knew the liquid for the slushie had to be cold. The measurements below for the tea bags, lemon juice and honey makes about 1,5 litres of iced tea. Add the tea bags and 1,5 litres of boiling water to a jug. Stir and let it steep for about 10 – 15 minutes. Remove the tea bags and add the lemon juice & honey. Stir again until you can see the honey has been dissolved. Refrigerate until the tea is cold. Pour the refrigerated tea into your frozen Zoku Slushie & Shake Maker and then start the scraping process I mentioned above. Once you have a delicious slushie consistency, add the peach pieces and mix. ♥ Being high in antioxidants (which help delay the signs of aging) and free of caffeine, the health benefits of drinking Rooibos are similar to green tea. It cleanses the body and skin & it helps to control your appetite (aiding in weight loss). ♥ Peaches are high in fiber and contain Vitamins A, C, E & K to help protect against sun damage & speed up skin regeneration. ♥ Honey rejuvenates skin plus is great for your immune system (these are only 2 of many health benefits). ♥ Lemon juice works as a skin cleanser because it has astringent properties (it cleanses internally). Enjoy on a hot Summer’s day (or even a cloudy day like today, if you’re a slushie fanatic like me). I think pomegranate rubies will be awesome in a slushie like this too! It looks and sounds so very yummy, I love drinking Rooibos tea but have never thought of using it in a iced tea. Yet another thing going on my Crimbo wish list, my boyf is going to wonder where I come up with all these things hehehee! It’s deeeeeelicious! For some reason I only drink hot rooibos tea when I have tummy aches (don’t really enjoy drinking it hot). But in an iced tea, it’s awesome! Sounds delicious!! I love peaches! What a neat little slushie maker, I have seen some similar to this one around here. I don’t know if they work though…hehe!! Hmmm yummy! Have to try this! Yummy!!! Can you do alcoholic drinks in the slushie maker? I’m aaaaall about the frozen alcoholic cocktails in summer! You can definitely do alcoholic drinks too! 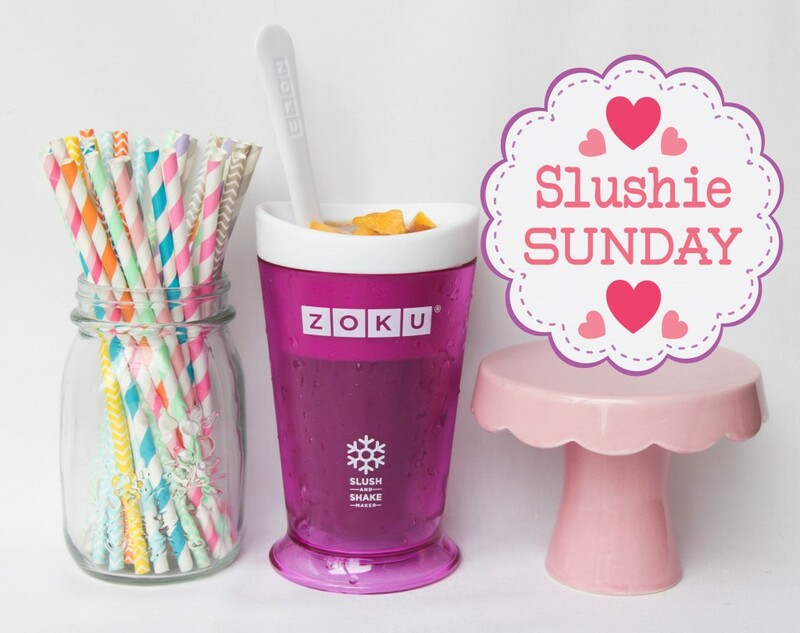 I bought the Zoku Slushie recipe book and they have a few alcoholic slushies / shakes in there! What a neat little invention! I am such a smoothie / slushie fan and I absolutely love your recipes. I have been making a few of them already and this one is definitely next on the list. I love your idea for making your own ice tea. I loooove ice tea and the thought of controlling what goes in it really appeals to me. You lucky girl to have a slushi/shake maker! Your recipe sounds delicious!